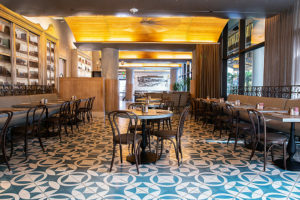 Offering indoor-outdoor dining and delivering a relaxed, warm and chic environment, reminiscent of Provencal cafes, Delphine acts as an ideal destination for guests of The W Hollywood, food-forward Angelenos, Hollywood tourists and Pantages Theatre goers. The bright shining star of the Hollywood Boulevard, Delphine sits lavishly in a 6,000-square-foot space that it shares with the other two indoor and outdoor lounges of the W Hollywood Hotel – The Living Room and Station Hollywood. Its elegant design by NY based designer Mark Zeff combines the breezy atmosphere of Southern France with that of the glitzy air of LA (Think Monaco meets LA). Even though Delphine lies in the very heart of Hollywood, it somehow exudes a beachy, relaxed vibe owing to its sophisticated yet casual and comfortable design with vaulted wood ceiling, blue and white floor tiles, white straw-plaited chairs and oval mirrors with massive wooden frames. Delphine is particularly popular among the theatre lovers of the city as the iconic Pantages Theatre is right across the street. One can find a lot of hustle bustle happening here just before a show is about to begin or after it has been concluded. 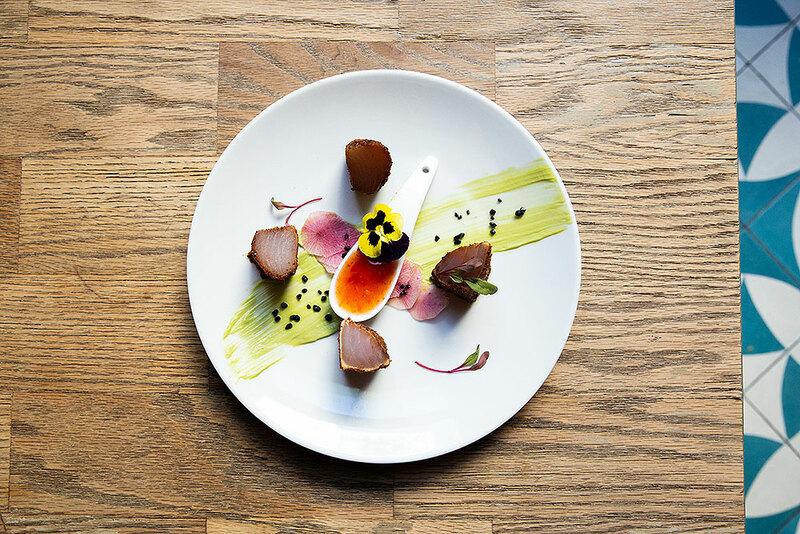 Located on the eastern end of the Boulevard, Delphine offers Contemporary American Cuisine with a Coastal Californian twist. Chef Charles Lacad has prepared this menu with a special focus on fresh and organic ingredients. 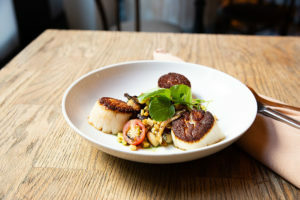 Some of their most popular delicacies are – the legendary Delphine Burger, 12oz Bone-in Filet, house favorite Kale Salad with Charred Brussels Sprouts and Seared Maine Diver Scallops. The California theme further comes alive with appetizing preparations like – Seafood Stew, Lobster Artichoke Melt and the Herbed and Caper Chicken. The wine selection at Delphine is quite impressive and friendly on the wallet! One can order the basic wines by the glass or can opt for a carafe. If looking for more than just the basic, explore their wine list in their bar menu that includes a carefully-handpicked selection of both, red and white – light, medium to full-bodied wines. Desserts are minimalistic but delicious, ranging from brownie ice cream sandwiches, signature French toast sticks to fresh fruit cups served with berry compote, chocolate sauce, and whipped cream. 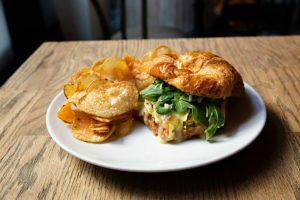 Delphine‘s staff members are exceptionally polite and helpful. There are very few places left in LA where one can find genuinely courteous staff, working hard to ensure their guests are having a fabulous time. This is one of those places! A Wonderful Gift Idea for the Princesses in Your Life! Experience the Wines of Portugal!